What are the important values in solar panel system? Maximum solar panel system watts. What is the rating needed for the inverter or regulator? Maximum solar panel system voltage. Is the total voltage suitable for maximum efficiency? Maximum solar panel system current. What is the cabling current rating required? Total solar panel area. Do you have enough area to mount the solar panels with appropriate aspect? Total solar panel system width. This information can be used for mounting hardware specifications. Use the solar panel calculator to work out the above information. 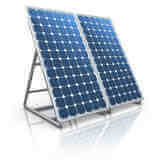 Enter your own value for the solar panels planned for use or select from the solar panel specifications table below.